A young man had walked over to the RV…and apparently hadn’t taken the time to read the entire tag line about running on veggie oil We started talking and I found out that he was a traveler as well, and very interested in all things “eco”. When he found out we were headed west, he implored us to stop at San Solomon Springs at Balmorhea State Park. He said that we’d be making a big mistake if we didn’t at least stop to see it. He lived just south of Balmorhea…so I figured he knew what he was talking about! We took his advice and decided to spend the morning checking it out…and we’re so glad we did! So what exactly is San Solomon Springs? San Solomon Springs has provided water for travelers for thousands of years. Artifacts indicate Indians used the spring extensively before white men came to the area. In 1849, the springs were called Mescalero Springs for the Mescalero Apache Indians who watered their horses along its banks. The present name was given by the first settlers, Mexican farmers who used the water for their crops and hand-dug the first irrigation canals. Situated about four miles west of Balmorhea, Texas, the 45.9-acre Balmorhea State Park was constructed by Company 1856 of the Civilian Conservation Corps, or CCC, between 1936 and 1941. The CCC was established as a New Deal program by President Franklin D. Roosevelt during the Great Depression as a way to employ people that would have otherwise been out of work. 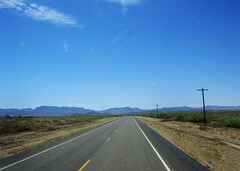 Many of the state parks in Texas were developed during this time. 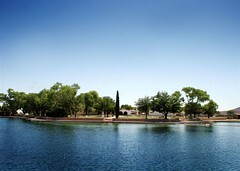 The 77,053 square ft San Solomon Spring is the focal point of Balmorhea State Park. From 22 to 28 million gallons of water flow through the spring-fed swimming pool each day. Other CCC structures in the park include a limestone concession building, two wooden bathhouses, an adobe superintendent residence, and San Solomon Courts, an early expression of the modern-day motel, constructed of adobe bricks. All of the CCC buildings are constructed in a Spanish Colonial style with stucco exteriors and tile roofs. It was a sunny day like no other…one that you just HAVE to spend near water! 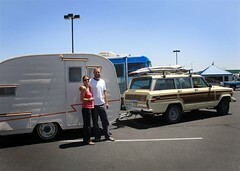 We pulled into the park, paid the day use fee…and parked the RV. We were the only vehicle in the entire parking lot, and as we walked over to the springs, we realized that we had the pool to ourselves as well! We laid out our towels and snacks and checked out the water…it was CHILLY! But the greatest thing…is that it was FRESH. NO chemicals…chlorine, nothing. Just good ‘ol water! The sheer number of gallons that flow through it each day is incredible (see description above). We had a great time splashing, swimming, and jumping off the diving board. We met another family there who came in a bit later…they were on vacation and the dad was originally from Bozeman. Small world! They let us borrow their little floaty boat, and Bella was pleased. We packed up and made a little lunch in the RV and then traveled onward. We drove to a little campground in western Texas and settled in for the night. There was a swimming pool there, so Bella was super excited to check it out. The next day, Matt went to talk with the owners about their grease, because they had a little cafe on site. Turns out, they did have grease. A LOT of grease. There was a 1000 gallon container of perfect oil … and it was filled nearly to the brim! We were giddy with excitement, of course, and we topped off the tank and all of our extra containers. We headed out across the beautiful landscape of the southwest…through New Mexico and Arizona…stopping at the Camping World in Tucson to replace our broken motorized step. It was fun to see Tucson…even in passing, because it’s my birthplace! I was born at Davis Monthan Air Force Base while my mom and dad were stationed there. My dad was in pilot training for the Air Force back then (and just to brag on my dad a bit…he’s a 2-time Top Gun winning fighter pilot! Dad, you rock!). While Matt replaced the step, Bella and I went for a walk around the parking lot and we stumbled upon the CUTEST little trailer and we just had to check it out. The owners of the trailer, Justin and Julie were from a little town outside Telluride, CO and had just trekked back to the US after many weeks in Mexico. They were making repairs on their trailer as well, so we had a little camp out right there in the parking lot and got to know them a bit better. Bella really, really wanted to move right into their cute little camper…it was just her size! Back on the road, we realized that we were getting dangerously low on fresh water in our tank. We knew we’d be boondocking (camping without hookups) that night in the Phoenix area, so we needed to find some. After striking out numerous times, we came across a nice 55+ RV park just off the interstate and they were kind enough to let us fill up with nice cold water for free! What a blessing! We rolled into Mesa, AZ and found a brand new Wal-mart in a nice neighborhood to park in for the night. We had one entire side of the building to ourselves…and the landscaping was so nicely done, I felt like I had my own little garden We slept hard, and awoke the next morning…ready to go pick up my parents from the Phoenix Sky Harbor airport!